This is a Grenado/Canister Bomb Saboteur that uses the Barrelsmith’s Twins set. I’ve been using it to farm Fabius, Zantarin, and Mad Queen. This build is LOTS of fun, when you get multiple procs of Ulzuin’s Chosen in a row you deal HUGE burst damage. Unfortunately I would not go Saboteur for the Barrelsmith set anymore. After tinkering with Grimtools it's clear Saboteur is totally outclassed by Purifiers, who get Ranged Expertise, Deadly Aim, powerful exclusive skills (Aura of Conviction and Censure are both amazing), IMO Word of Renewal is superior to Pneumatic burst, also you get powerful WPS including Bursting Round. Purifiers also end up with much more DA/OA than Saboteurs. Most Grenado/Canister Bomb builds I’ve seen have been either a Elementalist/Sorcerer/Commando. These seem like obvious choices because of powerful Exclusive skills but I didn’t want to sink 50 mastery points to get them. Saboteur works because you get massive Total Speed buffs (Vindictive Flame + Pneumatic burst) with minimal investment into the Nightblade tree. The result is a nimble caster/gunslinger hybrid that blows stuff up from afar. Use Grenado as a LMB and Canister Bomb as a RMB. 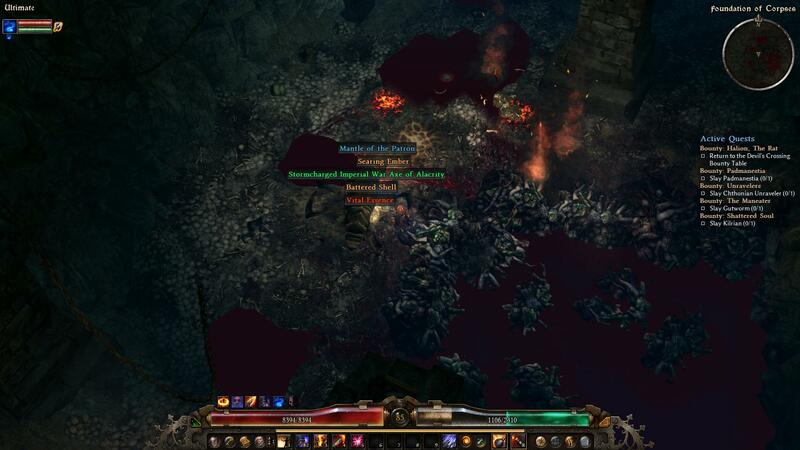 Ulzuin’s Chosen and cooldown reduction from the Barrelsmith set offers high uptime on these skills. When LMB and RMB are cooling down, use the strong debuffs Demolitionists have at their disposal. 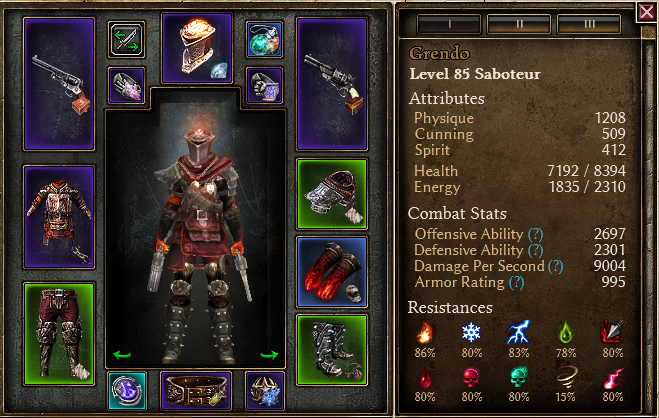 In between cooldowns, your default weapon attack is boosted by some nice WPS’s offered by the Barrelsmith set. 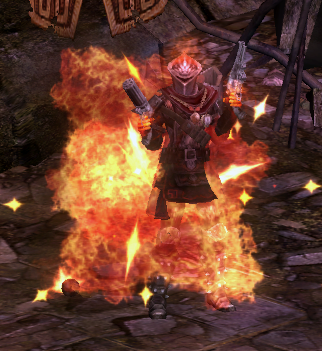 Because Ulzuin’s Chosen and the Barrelsmith set convert a lot of physical damage to Fire, the majority of damage dealt is Burn and Fire. Uses a lot of energy. 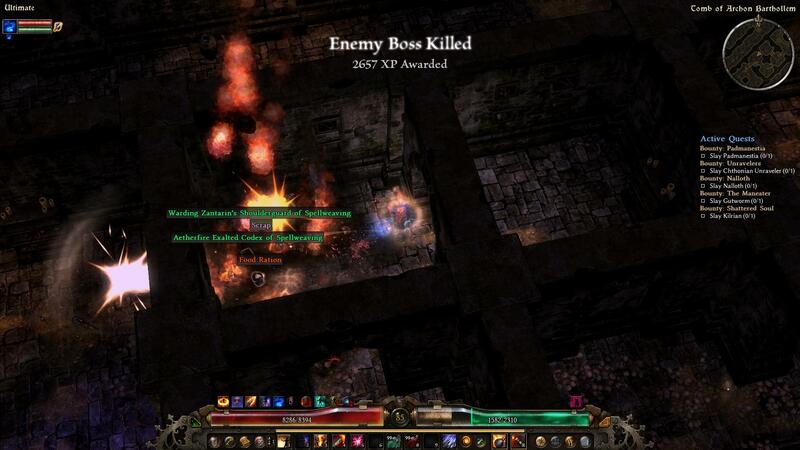 Saboteurs don’t have energy management skills so I make up for this with –skill energy cost and energy absorb from devotions/components/augments. Squishy due to low health but has a lot of defensive options. Gear note: Pants, gloves, boots, rings, and amulet are all flexible. I recommend you complete Infernal Knight's set for the nice bonuses to BWC and Thermite Mine. All attribute points to physique. Can be any green to fill resists. Outcast's burning mantle is OK. Infernal Knight's Pauldrons or Fabius' shoulderguard is probably BiS. Wyrmbone handguards is probably BiS, otherwise you can use Harvest Grips or Rhowari Handguards. Or any Sect-Legguards or Legplates of Valor. Any good green works here too. Or you can go with Pyroclasm Mark. Your primary damage source, on LMB and RMB. Linked with Meteor Shower and Eldritch Fire. For fire resist reduction. Since it’s awkward to use, I only spent 1 point. Huge OA reduction. I put one point in Night’s Chill to proc things. 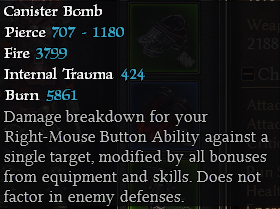 Very strong buff to the abilities you use the most. Also extremely fun when it procs multiple times in a row! I also spent 1 point in Temper, Phantasmal Armor, and Anatomy of Murder for some decent buffs. This build has energy issues because when Ulzuin’s chosen procs several times in a row, you’ll eat through energy very fast. With my setup, I regularly use Elixirs but am not energy starved. I’m running only 8k health but there are a lot of defensive options to make up for it. #1 defense is maxed move speed and high total speed, in this build you MUST kite everything. You simply cannot facetank ultra bosses. Last edited by chillstepbbc; 02-16-2018 at 05:25 PM. Good job making a build around the Barrelsmith's Twins set! Could you generate a link to the build using grimtools link? Imho, you should go 50 in NB mastery and put one point into BS it works really good with meteor shower bound on it. I tried making a Pierce+Fire Commando that used the Barrelsmith's Twins. It lacked flat resist reduction and it was hard to squeeze either BWC or Manticore to improve it. I'm going to wait for the expansion before I modify it further. You really end up point-starved using the twins. It honestly seems like going caster is a better option but then you miss all the WPS bonuses the Twins provide. On the other end of the scale if you focus on an LMB attack replacer like Fire Strike you'll have strong DPS but have poor nukes. etc. Perhaps the devs just want you to focus on one path or the other but not both. Meteor actually has 100% chance to proc from Grenado so I have no problem with uptime on that skill. I tried to avoid going 50 into NB so I could spend points on all the juicy Demo skills. I agree that in general melee outperforms casters in this game. My motivation was to make a build for Barrelsmith since I just finished finding the set. A melee saboteur, like jajaja's tri-elemental, probably has no space for Grenado/Canister bomb. Thank you for your comments Duck King, I actually watched your youtube videos when I was coming up with the concept. I originally started with BWC and Agonizing Flames for Physical/Pierce/Fire RR. But after looking closely at the damage tooltips it's clear most damage (~85%) is fire. So I went with Elemental Storm and specced away from Agonizing Flames, which opened up more skill points. I'm not sure which build is superior, probably the best way to know is to run some dummy tests but I hate wailing away at those things. I considered Fire Strike but I feel like my playstyle, which is using Grenado as LMB and auto-attacking in between cooldowns, is probably the way the set is intended to be played. Last edited by chillstepbbc; 04-04-2017 at 12:45 PM. 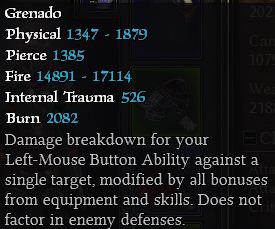 Meteor actually has 100% chance to proc from Grenado so I have no problem with uptime on that skill. If you bind Meteor to BladeSpirit and call two BladeSpirit, each BladeSpirit proc Meteor. @_@ well that would certainly be powerful. I literally waited for ages for that moment than somebody makes this build. At last my waiting ended.